«Studying and understanding the atmospheres of exoplanets is an indispensable step on the path towards addressing one of the oldest questions posed by humanity: Are we alone?» writes Kevin Heng, Director of the Center for Space and Habitability of the University of Bern and member of PlanetS. 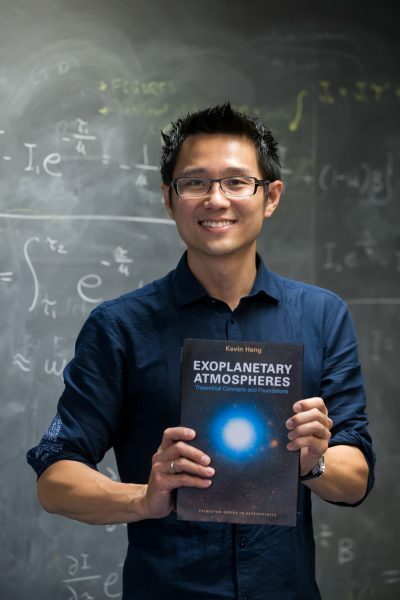 In his new textbook on the theory of exoplanetary atmospheres he gives students the tools to learn and research in this vast and interdisciplinary field. Originally Kevin Heng studied supernova remnants. But after his doctoral thesis in 2007 he switched to the subject of atmospheres of exoplanets – planets orbiting stars other than our Sun, beyond the Solar System. Today he is one of the world’s foremost experts in this young field of research. «The ultimate theoretical goal is to understand exoplanetary atmosphere so thoroughly that we may infer the presence of life from recording spectra and phase curves across galactic distances», the author writes in his textbook. After the first discoveries of exoplanets in the mid-1990s, the confirmed detection of such objects have increased exponentially and today number in the thousands. «It appears as if Nature is infinitely more creative than us at forming these new worlds,» Heng writes mentioning hot Jupiters – Jupiter-sized exoplanets orbiting their stars at a small fraction of the distance between Jupiter and our Sun –, super Earths – exoplanets with radii between that of our Earth and Neptune, which do not exist in the Solar System –, closely-packed multi-exoplanet systems, and circumbinary exoplanets – those orbiting a pair of stars like Tatooine, Luke Skywalker’s home in Star Wars. «What is the myriad of worlds Nature has formed in the broader Universe? What is the chemical inventory of these worlds? And how many of them are capable of, and are, harbouring life?» Heng asks. To find out, astronomers are building ever bigger and better telescopes that scan the heavens from ground and space. But to analyse, understand and make sense of the data gathered a solid knowledge of different disciplines such as atmospheric and climate science, astronomy and astrophysics, chemistry, geology and geophysics, planetary sciences, and even biology is needed. «Observations alone are not enough – theory to interpret the observations and to guide future observing strategy is key,» states Sara Seager, renowned professor of planetary science at MIT, in her foreword. According to Seager, Heng’s book is the most thorough text on exoplanet atmospheres to date. The author tells that first he wanted to write it in the style of «exoplanetary atmospheres for dummies», but he admits that this has evolved into something «slightly more sophisticated». Indeed, the formulas require a good knowledge of physics and mathematics, but the narrative prose interlaced shows the author’s love of writing and his skills in assembling things in the same manner as a cook preparing a recipe, «having gone to a culinary school and trained as a chef», as he states. Would you like to taste? Try to answer the quiz question. Click here for the quiz answer.